Le Linge needs you! Help us fund our fourth collection «Fluctuation(s)», upgrade your wardrobe and give us the opportunity to promote the work of talented artists. This project ended successfully on 24/8/2014 14:00! MERCI BEAUCOUP ==> you will receive a tote bag Flucuation(s) and our eternal gratitude. 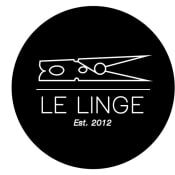 Born in 2012 from the collaboration between different artists from diverse universes, Le Linge is a non-profit clothing label which has the goal to promote the work of artists from Switzerland and elsewhere by allowing them to express themselves on a wearable canvas.